Clint Eastwood, eat your heart out. This just in: learning a language is difficult! I mean, really, very difficult. I’ve always known that I don’t have a knack for language. I was lucky that I was able to learn French when I was very young so I think that its foundations are permanently engraved into my brain. I tried to learn Latin when I was in university, but I only made it as far as Latin 100a. I still remember some basic vocabulary: sailor, girl, rose, and praise. Thanks to mandatory chanting in class, I can still conjugate “to praise.” However, if someone put a gun to my head and ordered me to put together a proper sentence in Latin, my best effort would probably resemble “An sailor gave a roses from the girl.” So, languages are NOT my forte. 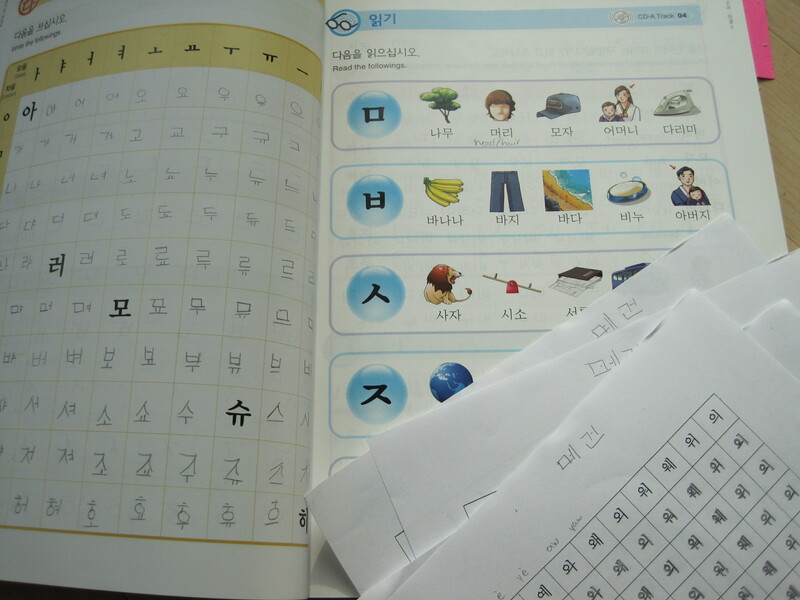 My first Korean class was on Wednesday and it was almost entirely devoted to learning the alphabet. The teacher would point at a symbol and we would try to make the sound. I can’t find a great way to explain the experience. Except maybe this: have you ever had the misfortune of being seated beside a linguistics class in an exam auditorium? It’s a bit distracting because the whole class spends much of the 2-3 hours trying to contort their mouths, tongues and throats to produce various sounds. I’m quite certain that an unknowing passerby would have thought we were taking a linguistics exam in that classroom. The only difference is that while the linguistics students try to make the noises under their breaths, we were making noises loudly, and in unison. Like a phonetically challenged adult choir. That night’s homework was to practice reading and writing the alphabet over and over. In the end, I was feeling pretty good. I could recognize all of the characters and I at least knew what sound they ought to make, even if I couldn’t quite produce the noise. This confidence was reinforced at the beginning of Friday’s class, when I proudly read words like “cucumber,” and “baby” in Korean. Excellent. Maybe learning a language isn’t so hard! If my life were a Western movie, then this would be the scene where we all have drinks in the saloon and a man in a vest plays bouncy music on the piano. Morale is high; the town has just rid itself of a confidence robber and it seem that the streets are once again safe. However, the drinking and dancing is interrupted when the doors swing open and a mysterious figure enters and leans against the bar, surveying the crowd. The camera pans to the wanted poster on the wall and the audience realises immediately that that the evil compound vowel is about to turn the town upside down. (He’s easily recognised because he has a bad moustache and brandishes not one, but two guns.) The compound vowel grins as he sees the horrified faces in the crowd. End scene. Where was I? Right…. Learning Korean. Well, I have brought my total Korean word count to about ten, and I can read most of the hangul characters. However, those darned compound vowels continue to mock me and they make opening my textbook a rather daunting task. I will keep on trying though, in hopes that maybe someday I won’t sound like a wannabe linguistics student. In the clint eastwood theme, remember, you just need to learn to say :”go ahead, make my day” in Korean. You can be a person of few words. Cucumber of course being one of them. 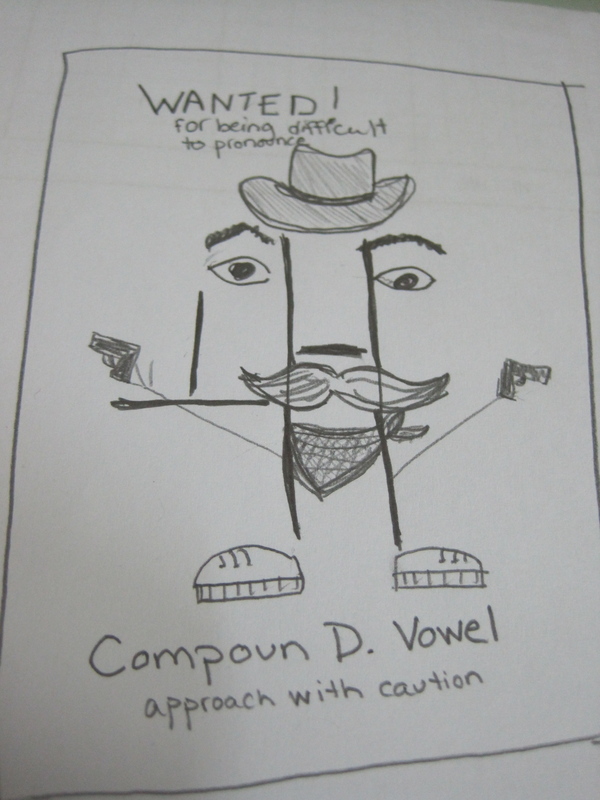 Oh my god Compoun D. Vowel, is the cutest bandit in the history of bad guys. This must make him extra dangerous.